In 90 days, on April 8, 2014 Microsoft will end extended support for Windows XP. This means that no additional security patches, bug fixes, or service packs will be released and that users will no longer have access to free or paid technical support. Systems running XP won’t suddenly stop working on April 8, but they will become increasingly vulnerable and the source of additional problems to your company. I doubt you have called Microsoft for XP support for years, so why is this a big deal? Well it’s not that Microsoft will no longer take a support call for Windows XP; the real issue is that new security exploits that come along for XP will no longer be corrected by Microsoft. Microsoft finds and corrects hundreds of security exploits within their operating systems every month; when your PC downloads a new Microsoft Patch; you are receiving the security corrections to harden your system from attack. 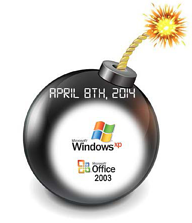 On April 8, 2014, Windows XP will be open season for security hacks, data hijacks and other vulnerabilities. You simply must protect yourself and your company data by removing all of your Windows XP machines from production! IT Security: The sudden absence of support for XP leaves a void that will likely be filled by a slew of old or soon to be exploited vulnerabilities that will subsequently give rise to a new crop of security exploits that target Windows XP systems. Without continuing security updates; older operating systems like Windows XP typically have more exploit activity due to the fact that the malicious code will have ample time to mature, circulate and infect your machines. There are also other reasons for considering removing your XP machines from production. IT Performance: Todays modern PCs have features that were nonexistent when service pack enhancements for Windows XP were discontinued. Today’s PCs include WIFI, Bluetooth, faster USB ports, and high resolution video graphics and touchscreen capabilities. Many of these features are either poorly supported or not supported at all by Windows XP Professional. Converting your old Windows XP machines over to Windows 7 can bring a huge performance boost. You will get the benefits of better device drivers, high speed WIFI, faster USB 3.0 ports, and double software speed execution with 64 bit software support. Office 2003: Unfortunately, Office 2003 is at the end of support with Microsoft. So, much like Windows XP, you need to determine if your company is still using Office 2003 which includes 2003 Word, 2003 Excel and 2003 Outlook. With all of this software becoming essential obsolete and worse than that, a liability to have on your network, what should you do? Windows 7 or Windows 8? Peter Klein the CFO for Microsoft said, “If enterprises are holding off on Windows 8, they are still embracing Windows 7 as an upgrade solution.” He continues, “This quarter we saw continued progress from the transition of Windows XP to Windows 7. Now, two-thirds of all enterprise desktops are running Windows 7.” ANP agrees that Windows 7 is the perfect replacement for Windows XP. Windows 7 will be supported by Microsoft until October 13, 2020, which is far more time than a new PC bought today will be in service. Next Steps: Take a careful look at your Windows servers and desktops and determine if you have any Windows XP still running on your company devices. If so, upgrade the machine and operating system at the same time. If you are not sure or don’t know how to take inventory of all of your Microsoft software you can reach out to ANP; we would be happy to help you in the assessment and also in the upgrade process.